The mission of Texas Department of Family and Protective Services (DFPS) Child Care Licensing is to protect children through regulation and education. Regulating all child-care operations and child-placing agencies to protect the health, safety, and well-being of children in care. Permitting and monitoring operations and agencies for compliance with state licensing standards, rules and laws. Investigating complaints alleging violations of minimum standards and reports of abuse or neglect in daycare and residential childcare operations. Informing parents and the public about child care, including how specific daycare and residential childcare operations are complying with minimum standards of care. Giving child-care providers technical assistance on meeting licensing standards, rules, and laws. The process to obtain a permit is designed to ensure the protection of children through a cooperative relationship between the Texas Department of Family and Protective Services and the potential applicant. If you are interested in starting a day care operation you will need to visit the DFPS website and follow the steps ensuring you do not miss any important pieces. Child Care facilities that meet certain requirements may become Child Care Services providers by signing an agreement with the Child Care Contractor. Access to the Betty Anderson Resource Room which houses over 200 developmentally appropriate curriculum boxes for provider check-out, 600+ die cuts, a monthly allotment of butcher paper and laminating materials. Access to live trainings, materials, resources, mentoring, and professional development trainings on DVD to assist providers in meeting required clock hours. Rural area providers would have access to the FROG Bus which delivers materials to every rural CCS provider on a monthly basis to promote quality child care. Additionally, CCS collaborates with Region 17, Texas School Ready, Headstart/Early Headstart, DFPS, university/college professors and mentors, credentialed child care professionals both locally and throughout the country, as well as community leaders in order to provide child care providers valuable information. What is a Texas Rising Star Provider? The Texas Rising Star program is “a voluntary, quality-based child care rating system of child care providers participating in the Texas Workforce Commission’s subsidized child care program.” TRS Certification is available to Licensed Center and Licensed and Registered Child Care Home providers who meet the certification criteria. The TRS Provider certification system offers three levels of certification (Two-Star, Three-Star, and Four-Star) to encourage providers to attain progressively higher certification requirements leading to a Four-Star level. 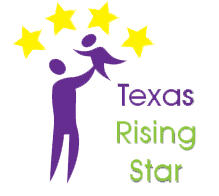 A Texas Rising Star (TRS) provider is a child care provider that has an agreement to serve Texas Workforce Commission (TWC)-subsidized children and that voluntarily meets requirements that exceed the State’s Minimum Child Care Licensing (CCL) Standards. Across Texas, parents and families enroll their children into child care programs, including center-based and home-based programs. Numerous research studies have shown that at-risk children who attend higher quality child care programs are more prepared for school entry than children who do not attend quality child care programs. Those providers that voluntarily achieve TRS provider certification, offering quality care that exceeds the State’s Minimum Child Care Licensing Standards for director and staff qualifications, caregiver-child interactions, age-appropriate curricula and activities, nutrition and indoor/outdoor activities, and parent involvement and education, are in a better position to contribute to the early development of children. Texas Rising Star providers are eligible for enhanced rates depending on the Star Level achieved and are assigned a Child Care Provider Services Mentor to help identify a Center’s need for quality funding which may be used in areas such as scholarships, equipment, materials, and curriculum.